lucky for you they wouldn't work in Oz Ken, too light, they'd just float way "downunder"
That is off the charts exotic stuff. You think they will stand up to daily beatings? (assuming its a daily bike). Do those rotors require specific pads I would imagine? OMG. Picture one of my Labrador's with me holding a 16oz tenderloin in front of their nose.......Rare. That's some serious Drool material folks. Those are worth more than what they're holding up... Amazing and beautiful! I'm green with envy, as the saying goes. No more teasing, next pic needs to be on the bike. Man I dont know how you even ride that thing around. It would be hard for me to put it out of my mind how nice all that stuff is. Must also hugely improve suspension with SO much less unsprung wieght. Why the Dymag vs the BST? WOW! Congrats man. This mod takes you VTR to "LEGENDARY" status. Yellow was legal in Canada, though curiously the metallic blue (as mine) apparently was not in the US....... funny that....... I wonder if the wacky religious right found it offensive?????? Last edited by mikstr; 10-24-2014 at 04:38 PM. You are really trying to squeeze every bit of performance out of the VTR . 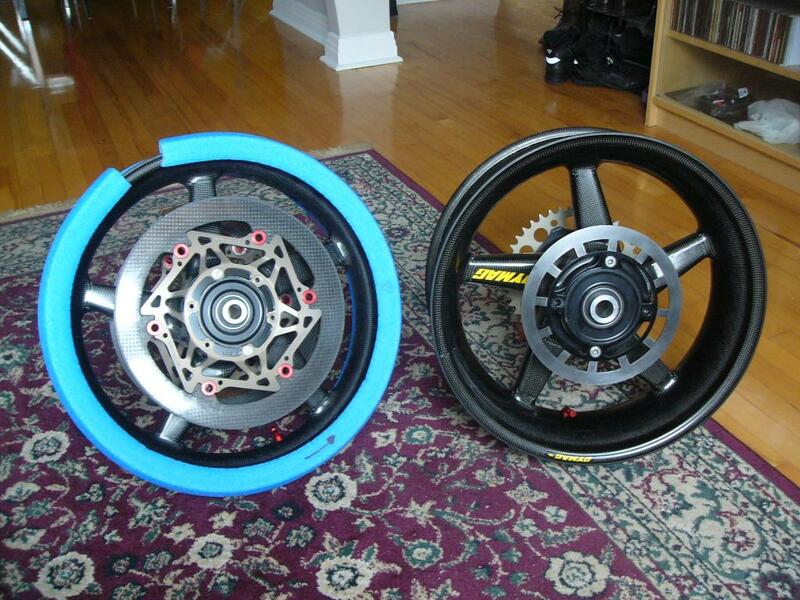 Just to get an idea, when you mounted the PVM wheels how much the handling and acceleration improved? Did the bike feel significantly lighter in the quick left/right switches? Does it accelerate faster coming out of a turn? As for the effect of the PVMs, I have been running them for so long now that I can't make an objective comparison (especially as I never swap the stock wheels back on to see). However, as the PVMs are about 9 lbs lighter, they simply have to be an improvement (the physics dictate it be so).